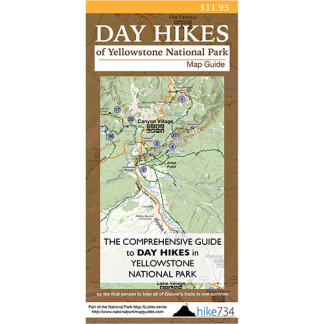 This trail takes you through broad open meadows near the Fountain Flats area, with the occasional beautiful spring, and a view of a dilapidated log structure. This very level hike starts on the old freight road. The views are wide open from a past fire, but new growth is making a comeback. Immediately before the bridge over the Firehole River, the beautiful Ojo Caliente Spring bubbles and steams from its clear, sapphire depths, and drains into the river over orange microbial mats. After crossing the river, the Sentinel Meadows Trail takes off to the right to begin the loop. 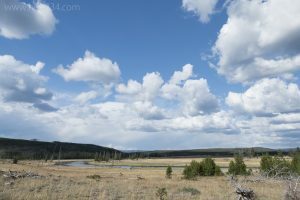 The trail follows the lovely Firehole River with open meadows and patches of smaller lodgepole pines. Keep an eye out for birds and wildlife in this area. You’ll depart from the river to a broad valley with a few large, steaming, prominent cones. Look to the west in Sentinel Meadows for a log structure next to a column of rising steam. This structure was going to be a public bathhouse, the first building ever constructed solely for public use in a national park, but was never completed. You can turn around here, or follow the trail as it wraps around through trees, and comes out to the meadows on the other side. Finding the trail here can be tricky, but keep an eye out for orange markers on trees and poles. Stay on the trail and watch your footing as wet areas, small streams, and hydrothermal features are everywhere. Eventually, past a few small springs, the trail meets up with the Fairy Falls Trail and continues to the old freight road. Take a left and head back through familiar open meadows and occasional trees. The ponds and wet areas are great places to spot waterfowl and shorebirds. Trailhead: Turn west onto Fountain Flats Drive off Grand Loop Drive between Old Faithful and Madison Junction, and drive all the way to the parking lot at the end of the road. The trail starts at the signed and gated old freight road at the south end of parking lot.